The debate over undocumented illegal alien immigrants in sanctuary cities and President Trump push for a Mexico border wall continues. How do Mexican drug cartels bring drugs into the US? Featured Image: Thanx to David Dees. From a guaranteed right to hormone therapy for transgendered illegal aliens, to a prospective Attorney General saying that illegals have the same right to a job as US citizens or legal immigrants, the ongoing sham of the Obama administration’s under-the-radar policies get seen in the light of day in Bill Whittle’s latest FIREWALL. Featured image: Obama mug shot. Arrested 29 Aug 68. CREDIT: Chicago Police Dept. A handful of House Republicans want to authorize the House of Representatives to file a lawsuit against President Barack Obama if he acts on his own to ease U.S. immigration rules. Image: Thanx to David Dees. Congress is back in session. And an Illinois Democrat plans to meet with President Obama this week—to “go back to the drawing board” on immigration. Featured Image: Taiwan National ID Card. CREDIT: jchung. SOURCE: Wikipedia (Public Domain) FOR ILLUSTRATION ONLY.
. . . “A national identity card is a portable document, typically a plasticized card with digitally-embedded information, that someone is required or encouraged to carry as a means of confirming their identity.” . 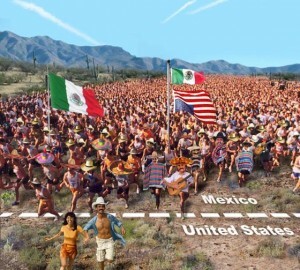 . .
Arrests of illegal immigrants crossing into the United States have nearly tripled in recent months in anticipation of Congressional efforts to enact comprehensive immigration legislation, border patrol agents told CBS News Wednesday. Thousands of protesters descended on Capitol Hill today to demand immigration reform. Over 100 local and national organizations came together to ask for a path to citizenship just days before the so-called “Gang of Eight” lawmakers are set to reveal their reform bill. RT Correspondent Meghan Lopez was at the rally and brings us this report. The long feud between “America’s toughest sheriff” and the nation’s president just got longer.Sheriff Joe Arpaio said Friday’s move by President Barack Obama to give amnesty to children of illegal immigrants is politically motivated and will encourage more Mexicans to cross the border but that he will still enforce all immigration laws in his state of Arizona. What is the “Right” Solution to the Border Crisis? So what is the right solution to the “Border Crisis“? Every president since Bush senior has declared there is a border crisis, but it wasn’t until Trump took office that it became “inhumane” to detain illegal aliens. Even though we have been doing that all along and under worse living conditions than now. If there were a physical barrier along those long stretches between entry ports along our southern border, the current Border Patrol personnel could handle the load instead of combing the desert using half million dollar thermal imaging devices and desert patrol vehicles. But Nancy wants 30.000 additional people (times 40,000 to 60,000 dollars per year while working ($1,350,000,000) plus a retirement level equal to say 10 or 12 thousand a year) equipped with super high tech desert patrol vehicles. Just how fast will that add up to the cost of the barrier? Maybe 10 years. Maybe. More like 8 or even 6. But once they are on the government payroll, the bureaucracy won’t let them go, so no matter how much illegal or legal immigration falls off, those additional government employees billets will never go away. Bureaucracies simply don’t work like that. and does not include the overhead rates (yes, gov’t activities charge an overhead rate). Without looking up the exact rate for each locality (yes, they vary), I could make a very conservative guess that the rate (that includes the wages paid) would be something over a hundred dollars per labor hour. If each new agent worked full time with out any over time (yeah, right), that would be 2,080 hours times 100 dollars per hour times 30,000. (drum roll, please) that comes out at $6.24 Billion in the first year. Yes, that’s over a half a billion dollars more in the first year for labor alone than Trump requested in the first year.for a permanent one time, (non recurring cost) physical barrier. Now, take that times a 30 year career for each of those 30,000 employees: $187.2 Billion dollars for labor alone, without folding in cost of living allowances (COLA). Shall I do the math for the “hi tech barrier” that will be better and “more humane”? Did I mention that the hi tech desert patrol vehicles outfitted with all the gizmos and dodads cost in excess of half a million dollars each and that those thirty thousand additional agents will be 2 to a vehicle? If the current work force of 21,000 also get those sweet rides, then that’s another bunch of overpriced hardware. Oh wait, I guess I already did that math: $12.75 Billion, and I assure you they will be top heavy and will roll over killing some of those agents just as the HMMVV’s did in Iraq and Afghanistan, just costing way more up front. And they will have to be replaced as soon the contractor supplying them needs a shot in the arm or there is some “upgrade” available. And then there are the drones that Nancy wants to use to patrol the border. The ones she has in mind are very much like the ones we use to kill terrorists, but they will be flying over our own cities. Please build that wall and double the capacity to process immigrants at the ports of entry and triple the potential to deport those who choose to ignore the law. President Trump unveils a strict 70-point immigration plan including the border wall, dealing with sanctuary cities, DACA, more ICE agents and more. Trump is demanding strong immigration reform. 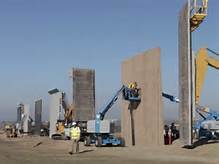 Building border wall, more ICE agents and stopping sanctuary cities by cutting federal funding.